On Christmas Day I noticed many birds feeding on emerging termites next to the R102 in Southport. Initially birds were only hawking termites by flying from trees on one side of the road, to trees on the other side, catching termites en route. Aerial feeders included mainly swallows and swifts, Village Weavers and Thick-billed Weavers. It was interesting to watch a male Thick-billed Weaver with his heavy bill, managing to catch termites in the air. 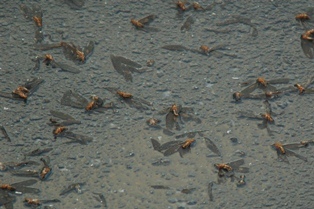 Later few termites were flying and a small flock of Village Weavers descended to the tar road and grass verge to feed on winged termites that were injured or killed by passing cars. 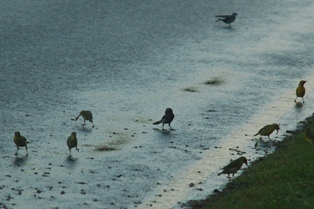 Comments have been made about the stratification of birds feeding at termite eruptions, but here the swallows and weavers were all feeding at mixed heights above the road, from low to tree height. The greatest factor here seemed to be where the most termites were to be found. 22 of the 29 southern African weavers have been recorded as feeding on termites (references for these are provided in Promerops 286:14). Not recorded as feeding on termites yet are: Red-billed Buffalo-Weaver, Southern Brown-throated Weaver, Chestnut Weaver, Olive-headed Weaver, Cardinal Quelea, Red-headed Quelea, and Yellow-crowned Bishop. Outside of southern Africa, many other weaver species have been recorded as feeding on termites, e.g. Golden-backed Weaver Ploceus jacksoni, Northern Masked Weaver Ploceus taeniopterus, and Heuglin's Masked Weaver Ploceus heuglini.